Contact Plus City Reflex Tire 26"
The Continental Contact Plus City Reflex Tire 26” is robust, specifically designed for urban and e-bikes. Its casing is highly elastic, providing low rolling resistance without skimping on comfort that in turn increases battery efficiency. Featuring ample puncture, slash, and tear resistance, the Contact Plus City Reflex is sure to achieve a high-mileage, perfect for city riding. 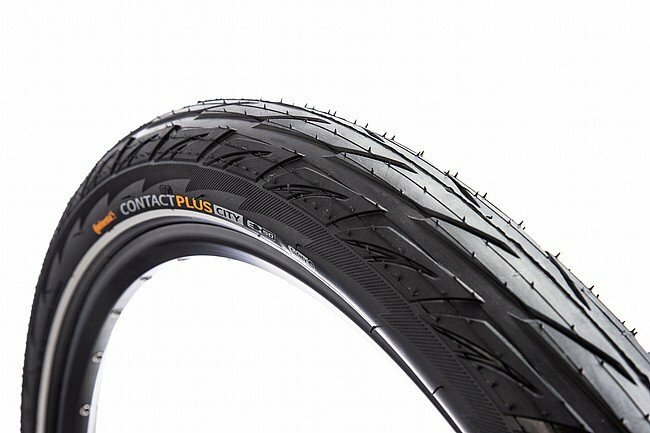 The Continental Contact Plus City Reflex Tire is available in two widths: 1.75", or 2.2". Also available for 700c tires. As expected these are very tough tires!!! Marketed as Ebike tires they are holding up well for a 26 Tandem 400lbs. We can reach very high speeds and these tires are-very steady. Very thick tread, stiff stable sidewall gives a peace of-mind.